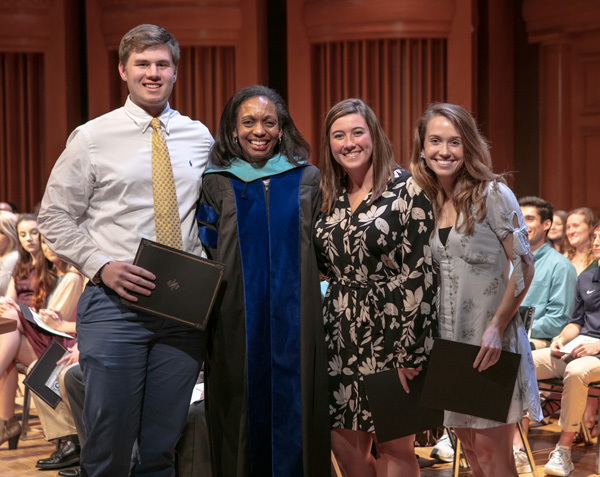 End of the academic year activities have begun as Reinhardt University honored high-achieving students and esteemed faculty at the annual “Evening of Honors” Tuesday. (Left to right): Bradley Luke Hayes, Dr. Mellanie Robinson, Randi Harbuck and Jane Howell. Held each spring near the end of the academic year, the annual “Evening of Honors” features scholarship and service awards for juniors and seniors and recognizes faculty members’ exemplary work over the past year. Schumacher quickly found his place at Reinhardt his freshman year on the gridiron, but soon realized there was so much more to do than football. While earning his bachelor’s degree in mathematics, he served on the Student Activities Council, as an Orientation Leader and Admissions Captain, participated in School of Performing Arts productions and excelled in the Honors Program. “I have been asked why and how I do so much. I love this school and everyone in it to such an extent that I feel compelled to give back the experiences that were so generously given to me. Reinhardt made me more than a football player, it made me a man,” Schumacher said. A man who chose to return to school while married with three young sons and working a management position with the Cherokee Sheriff’s Office earned the 2019 Non-Traditional Student of the Year Award. Lt. Mark Anderson – a U.S. Marine Corp veteran – will graduate in May with his Bachelor of Organizational Management and Leadership. 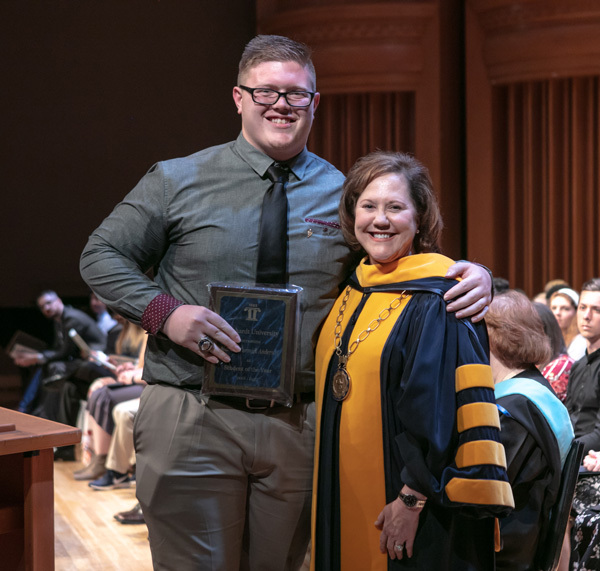 The No Greater Love Award was given to Carson Ivester, a senior early childhood education major, who will graduate in May. The No Greater Love Award is given to a student who exemplifies John 15:13, showing care for others and is ready to help. – along with Good – focused on the long 18th century (1675-1800). They traveled to Washington, D.C., where they studied “Mrs. Knight’s Receipt Book, 1740,” along with other secondary sources. Gray completed her degree requirements in December and will participate in the May Commencement Ceremony. Dr. Anne Good won the Vulcan Outstanding Teaching Award, given in partnership with Vulcan Materials Company’s Southeast Division, is awarded to a faculty member who consistently reflects excellence in their teaching and work with students. Dr. Joe Mullins, program coordinator for the Sport Studies program and the new Master of Science in Sport Administration and Leadership, was given the United Methodist Exemplary Teacher Award. Drs. Efe Seven and Ken Wheeler were jointly given the Faculty Research & Scholarship Award, for their scholarship work and published research over the course of the academic year. 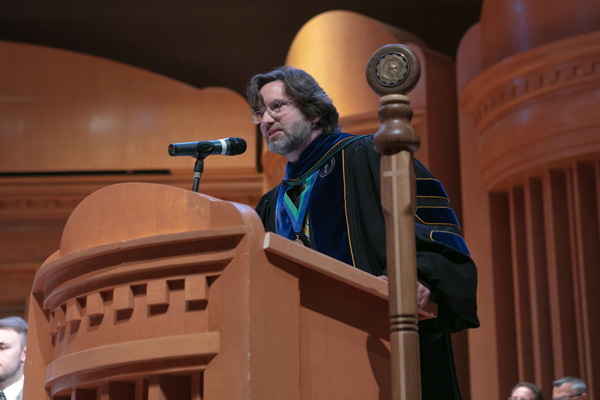 The Faculty Artistic Award was given to Bill Walsh, coordinator of the Master of Fine Arts in Creative Writing. Dr. Cheryl Brown earned the CITEL’s first Innovative Teaching Award. Dr. Theresa Ast was given the Elizabeth Moss Bailey Faculty Mentor Award, voted on by Reinhardt University students. Performing Arts: Kaleb Harkins and Dominique Xiong (Music Education), Dylan Cronan and Jaime Mandujano (Music Performance), Stephanie Kinney (Sacred Music), Rhonda Kelley and Daniel Schmidt (Theatre Studies) and Chase Brackett and Nicole Korch (Musical Theatre).